Ahoy! 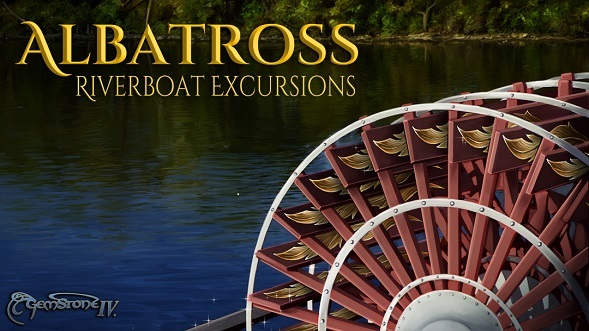 Captain Parlay is offering four-hour river excursions on the casino riverboat the Albatross! Enjoy the wide array of gambling games, including Roulette, Let It Ride, Pirate Lottery, Chain Tumblers, and more! Move on to Silvers' Taproom and the Bewildered Buffet to enjoy a delicious assortment of food and drink and catch up with friends around a dining table! Adjourn to one of the private suites for a brief respite before disembarking at the end of the voyage. Shopping is available in the Smoke Stack, the Gift Shop, and the Ladies' Luck Lounge. A merchant will be available in the Merchant's Nook, ready to provide general alteration, lightening, or deepening services to passengers. Up to 25 players can sign up for each riverboat excursion. There is a three-service limit for each account. Offered services are description alterations, making an item weigh 10% less down to the container's limit, or making a container hold 10% more up to the following limits: backworn and cloakworn items up to incredible; shoulder-slung items up to particularly large; belt, beltworn, headworn, leg-worn, chest-worn, or over-the-front items up to fairly large; and any other container up to slightly small; however, items this last category will not be able to hold individual items that are larger than 2 pounds each. Pinworn containers are not eligible for the deepening service. Please review the ALTER verb and ANALYZE your items to make sure you are prepared with your items and ideas when it is your turn. Ideas that do not comply with the rules in the ALTER verb will be denied. The merchant always has the final say on whether your item is eligible for a service. When it is time for the excursion, you may access the riverboat via the MERCHANT verb. You will be able to travel between the Albatross and where you came from at will!